Greece has been accused of wasting time after weeks of wrangling over economic reforms needed to extend its eurozone bailout and pay its debts. Strong statements from Eurogroup head Jeroen Dijsselbloem and German Finance Minister Wolfgang Schaeuble have created an impression that its new left-wing leaders are not pulling their weight. German tabloid Bild recently launched a campaign against an agreement, printing the banner headline "NEIN!" across an entire inside page, and encouraging readers to take selfies with the poster. "No more billions for greedy Greeks," it demanded. It was a characterisation familiar to many in Greece. "The reaction of the European Union countries to the new Greek government's attempts for renegotiating on the debt issue as well as the reforms it is currently proposing has been, sadly, predictable," says Athens-based entrepreneur George Kollias. "It is easy and equally wrong to use stereotypes such as lazy and greedy to characterise all Greeks, a trend that can also be seen in the attempt to create a caricature out of the Greek finance minister, not on his proposals but on his persona." Similar language was heard back in 2010, when Sweden's Finance Minister, Anders Borg, said: "Obviously, Swedes and other taxpayers should not have to pay for Greeks who choose to retire in their 40s. And, on Monday, the chair of the Eurogroup, Jeroen Dijsselbloem, called on Greece to stop "wasting time" and get down to serious talks to secure an extension of its €240bn (£176bn; $272bn) bailout. This is less explicit perhaps, but could the stereotype of the "lazy" or "greedy" Greeks, dragging their heels, be permeating the language surrounding the debt talks more widely? "That narrative has certainly taken over," says Raoul Ruparel, head of economic research at the think tank Open Europe. "One point that always comes up is that it's easy to retire very early, or get very generous pensions." Figures from the European Commission suggest Greeks do retire earlier on average than many others in the EU - but the margin is not quite so pronounced. In 2012 people in Greece received their first pension payment at the average age of 57.8, the data show. The country ranks just below Italy, where the average age is 58, while Germans took their first pension payment at 61.1. The EU's figures also put Greece's spending on pensions, as a percentage of its gross domestic product (GDP), as the highest in Europe in 2012. But last month the Wall Street Journal took the figures and divided them by the number of people over 65 in each country to come to a different conclusion. It found that spending per head in Greece was less than the EU average, and behind that of Germany, Ireland and Italy among others. And figures from the Organisation for Economic Co-operation and Development (OECD) would appear to give a picture of Greek workers that is far from lazy - they say Greeks work the longest hours in Europe. Experts say this is partly due to the nature of work in Greece compared with elsewhere - with more people employed, for example, in agriculture or in shops with long opening hours - and differences in efficiency. But they also take fewer holidays than workers in Germany, France and Sweden, according to EU figures. Data can be used to back up different arguments - and it is important to remember that countries have different ways of collecting it. But with Greece's debt now at 175% of its GDP, what is clear is that the country has been living beyond its means. Greece is still not producing enough of what the world wants and is not earning sufficient money for it, focusing heavily on tourism, shipping and exports of fruit and raw materials. 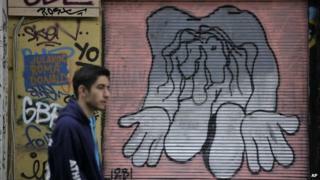 This has left Greece's leaders under pressure to show how they are going to raise funds, change systems and pay back the country's debt, which stands at about €320bn (£237bn). Image caption Will Greek tax-dodgers have to beware of holidaymakers bearing cameras? Their plans include combating tax evasion and tackling corruption, and there are suggestions they could hire "non-professional" inspectors, including tourists, to spy on tax evaders. Mr Ruparel says tax evasion in widespread in Greece, carried out by middle-earners and not just "big property owners". "It's not through complex schemes, it's simply through shops not giving receipts, and the government not keeping track of what people earn." The extent of the problem makes it easier for that stigma of the "greedy" Greeks to take hold, he adds. Meanwhile observers say there is some scepticism over how the Syriza-led government will create an infrastructure capable of stopping the problem - as well as pay for it. And Michael Fuchs, vice-chairman of Chancellor Merkel's CDU parliamentary party, told the BBC last month that Greece's lack of a proper land registry enabled corruption and threatened to prevent the country raising funds from privatisation. Sandro Scocco, chief economist at the Stockholm-based think tank Arena Ide, says he expects Syriza to continue to pursue the political values that helped it win the general election in January - such as rolling back on austerity measures - despite the pressure. "We are still going to hear that they are not doing enough." The idea of lazy Greeks is a "deeply unfair description", he believes, used by politicians to defend themselves by claiming their voters want them to be tough on the Greeks. "Using simple and erroneous explanations to single out scapegoats does not bode well for the future or for the EU," he wrote in a Social Europe blog earlier this month. "If this continues there's probably not much hope for Greece - and perhaps not even the euro." It has not always been the Greeks that have been portrayed this way. In the mid-19th Century, rather than efficient and hardworking the Germans were typically described by the British as "a dull and heavy people", says Cambridge University economist Ha-joon Chang. He points out that Frankenstein author Mary Shelley wrote after a particularly frustrating altercation with her coach-driver that the "the Germans never hurry". Back in Athens, George Kollias is anxiously waiting for a decision on his country's finances. "My greatest fear at this moment is that the discussion at the EU is not held on a collaborative and constructive level but a punitive and political one," he says.